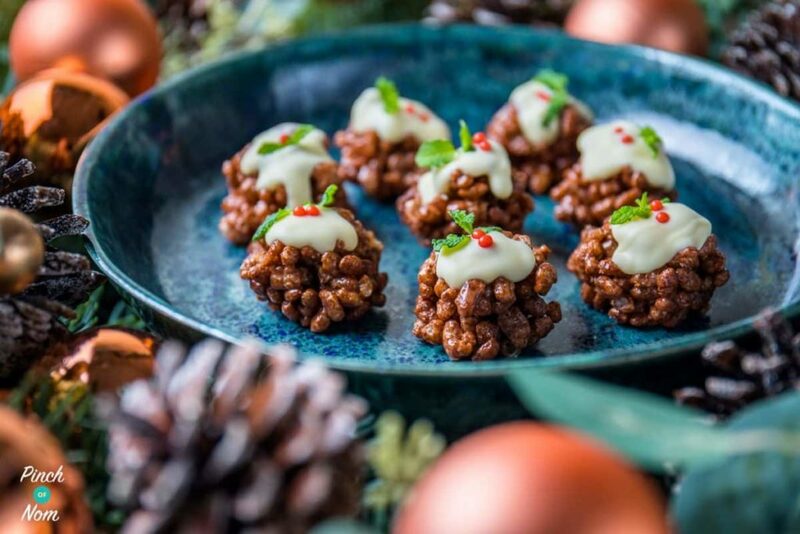 Christmas party canapés wouldn’t be complete without some sweet treats, and these Low Syn Chocolate Crispy Christmas Puds fit the bill perfectly! When making these, it’s important to let them set before trying to shape them or you’ll end up in a sticky chocolate mess…like I did the first time I made them! You can decorate these however you like – I like to add some berry coloured sugar balls with some tiny herb leaves, but you can also buy ready-made edible holly leaves which would also look pretty. But if you do don’t forget to add the syns. With only 4 ingredients, these Low Syn Chocolate Crispy Christmas Puds couldn’t be easier. 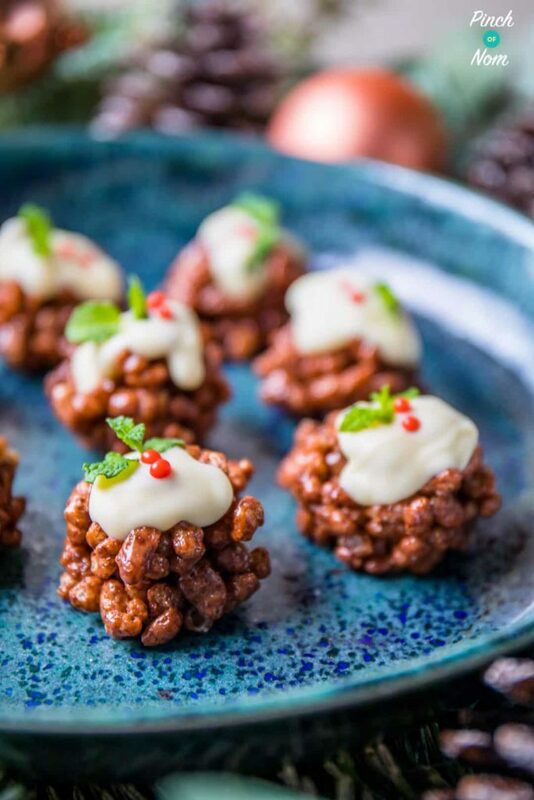 Yes, these Low Syn Chocolate Crispy Christmas Puds may cost you a syn or two, but they’ll definitely satisfy those sweet cravings. So why not give them a go. Some of you love this Low Syn Chocolate Crispy Christmas Puds recipe! 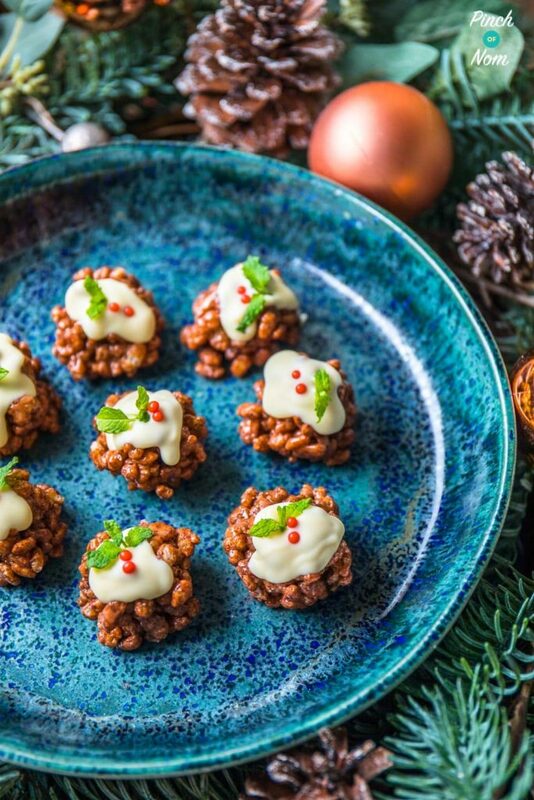 If you make this Low Syn Chocolate Crispy Christmas Puds recipe, snap a pic and hashtag it #pinchofnom — We love to see your creations on Instagram, Facebook, & Twitter! 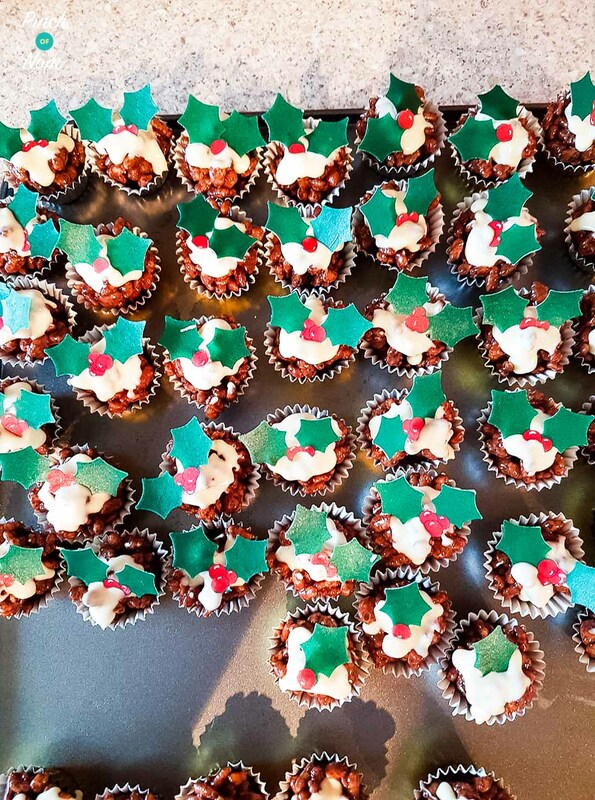 First up we have Janice from our Facebook group – her Low Syn Chocolate Crispy Christmas Puds look marvellous!! Joy Grady also from our Facebook group also had a crack at them – stunning! 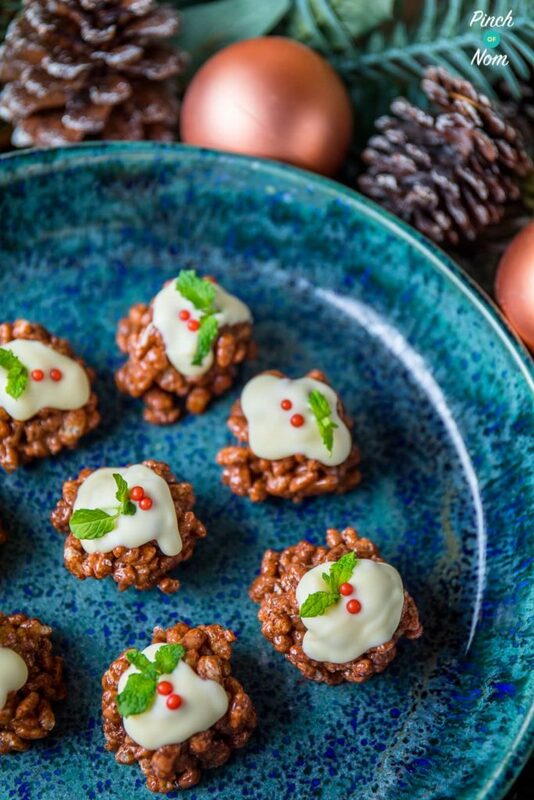 What do I need to make these Low Syn Chocolate Crispy Christmas Puds? 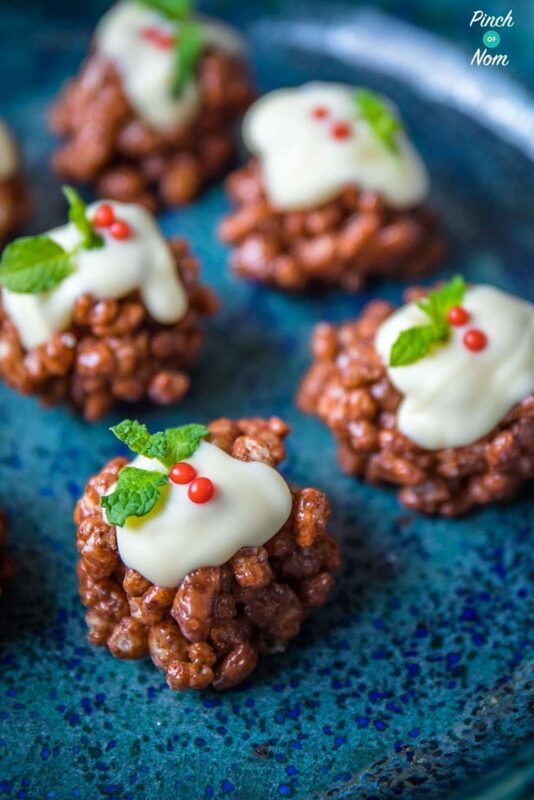 For decorating these Low Syn Chocolate Crispy Christmas Puds you’ll need some white chocolate, some small herb leaves (like mint or basil) and some edible red balls. We tend to use chocolate chips as they tend to melt a little bit easier than larger pieces of chocolate. For the ‘holly leaves’ we used small mint leaves, but you could use some basil. You can pick some ‘berries‘ up on Amazon. 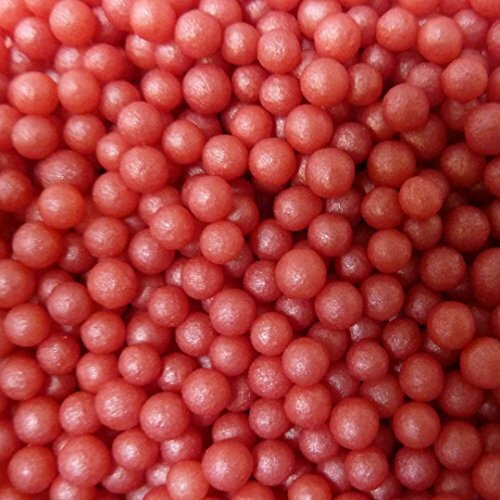 Or Morrisons sell some Chocolate Dots Sprinkles which contain some red ones. How many Syns are in these Low Syn Chocolate Crispy Christmas Puds? These Low Syn Chocolate Crispy Christmas Puds work out at 1.46 Syns (rounded up to 1.5) each if you use 4 fun size Mars Bars at 4 Syns each. You could also use 2 x 39.4g, but this would work out at 1.53 Syns, so it’s up to you if you want to round it up to 2 Syns or down to 1.5. 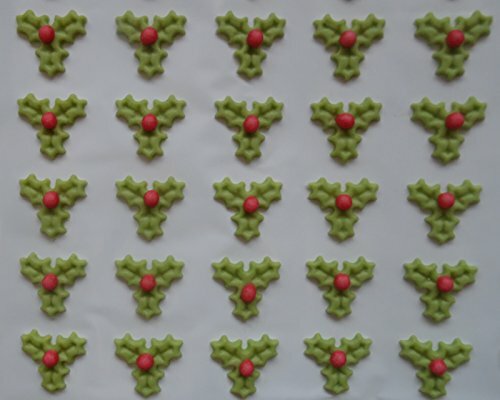 If you decide to use ready made holly decorations don’t forget to add on any extra Syns. Want to see how easy these Low Syn Chocolate Crispy Christmas Puds are to make? 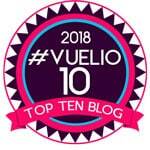 Watch the video! 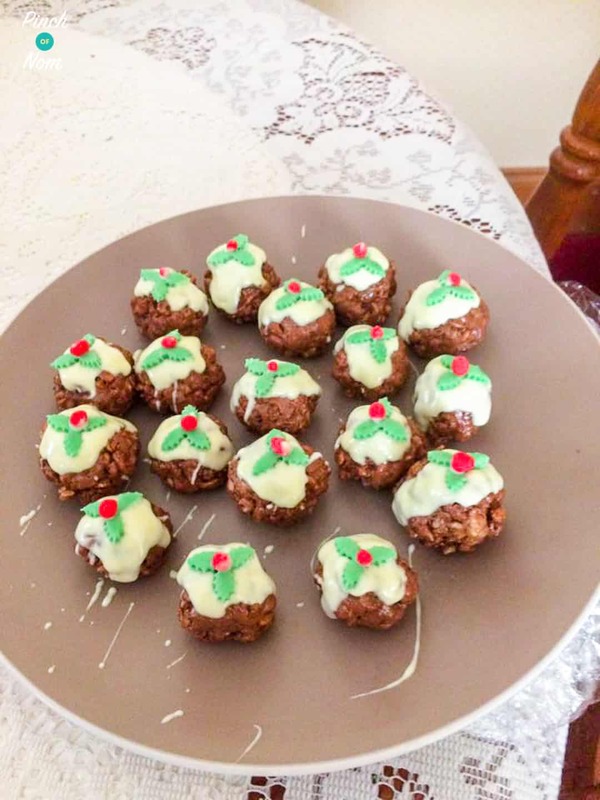 How do I make these Low Syn Chocolate Crispy Christmas Puds? Halve the Mars Bars and put into a microwaveable bowl with the Flora Light. Microwave in short bursts until melted. Fold the Coco Pops into the chocolate mixture, ensuring that the are all fully coated. Place 30 small heaps of the mixture on to a baking tray. Place in the fridge for around 15 minutes until it has firmed up. Shape into balls. Melt the white chocolate and drizzle a little over each ball. Decorate with sugar balls and herb leaves, or some ready made edible holly decorations to make them look like Christmas Puddings! Like this Low Syn Chocolate Crispy Christmas Puds recipe? Check these out! Like the bowl in the photos? We LOVE them. I have a bit of an issue with plates to be fair, we have a whole heap of them. This bowl is made by Geraldine of GXDesigns. You can find her on Esty and Instagram! Onto a tray place 30 small heaps of the mixture. Place in the fridge for around 15 minutes until it has firmed up. Shape into balls. We’re aren’t trained by Slimming World nor authorised to give Slimming World advice. 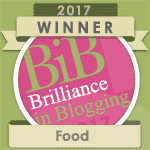 Should any advice given here should not replace the advice of your Slimming World consultant. Made these yesterday for taster – group absolutely loved them, thank you! You’ll need to judge it by eye, really, but approx 1 tsp. The mixture makes 30 little puds, so to keep the syns accurate, you’ll need to make sure you divide the mixture into 30. Thanks for your lovely comments, so glad you enjoyed them! What did everyone use as holly decoration?? You would need to check the Syn value of anything that you add, but the tiny edible cake decorations will only have a negligible Syn value per serving. Really want to make these for the party. Mine were also too sticky to roll into balls, even after over an hour in the fridge, so I’ve popped them in the freezer and hope that works 🤞 maybe the balance of chocolate to caramel isn’t quite right? Would 2 normal sized mars bars work better? We have had lots of members who posted comments and photos to say they’ve made these. Rather than roll them, the easiest way is to shape them as well as you can using a spoon. It can also help to put the mixture into small cake or petits four cases. These went down a storm at my early Christmas party this week. I’m making these for a third time this week. This time for my kids. Thankyou. Thanks for getting in touch, so glad you enjoyed them! Where would I get the sugar balls from? 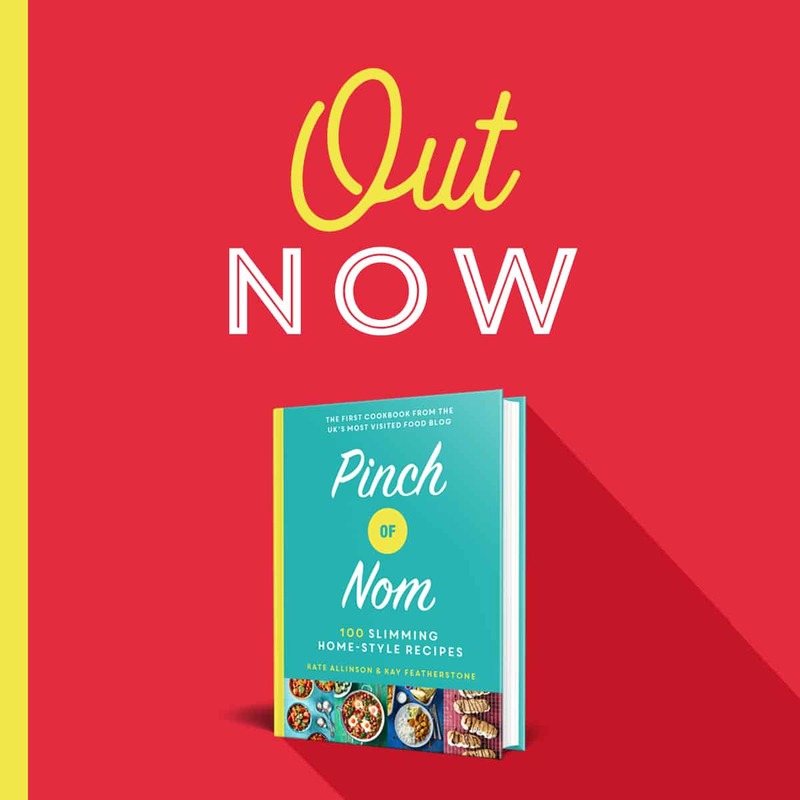 Thank you for this one, going to try these for tasters next time, our slimming world group, like the banana cake I make, (your recipe) again thanks, but these look scrummy, for a sweet treat. Hi there, do you think it would be okay if I made these on Wednesday evening for taster night on Thursday evening or would they go too soft or too hard? Hi, would you know the weight of the fun size Mars or the total weight of the Mars used. I wont be able to buy the fun size bars locally but would be able to buy a bar and measure. Thanks. I made these today for taster/party night tonight, they worked really well. Many thanks for the recipe. I found tiny Christmas tree sprinkles at Waitrose that worked well as holly leaves and freeze dried raspberry pieces for the berries. Happy Christmas!